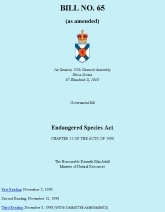 The Nova Scotia Endangered Species Act (NS ESA) was proclaimed in 1999. This act protects species in NS that have been assessed and determined to be at risk of extinction. The Act applies to all species at risk on private and provincial public (crown) land in NS. For more detailed information on the NS Endangered Species Act please contact any of the biologists at the Wildlife Division of the Department of Natural Resources listed on the Contact Us page of this website. The federal Species at Risk Act (SARA) was proclaimed in June 2003 and will come into full affect June 2004. This act protects species in Canada that have been assessed and determined to be at risk of extinction. 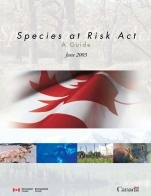 The Act applies to all species at risk on federal public (crown) land in Canada. The Act also applies to all migratory bird species at risk and all marine species at risk, on all land in Canada.